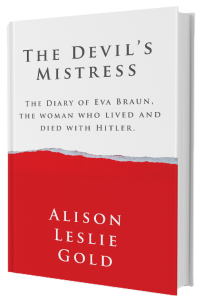 “Alison Leslie Gold’s fascination with the Holocaust has led her to try and imagine the inner life of Eva Braun (Adolf Hitler’s mistress). Alison sheds reality and tries to create from the bare bones of history a fleshed out inner life of Eva Braun. Her tool for entering the mind of Eva is a fictional diary written first hand from “Eva’s” point of view. Alison Leslie Gold’s other books on the Holocaust are non-fiction, and I highly recommend them. This book is a fictionalized account and must be read and relished as such. She brings to life the desperation of a young seventeen year old Eva, desperate to prove herself to her family, desperate to excel at something, anything. Her only form of valuable currency is her youth and beauty. Alison Leslie Gold in no way romanticizes her characters, in fact her strong distaste and disapproval of the characters about whom she writes comes though clearly. You could say that her repugnance of Eva and Herr Hitler are a character in themselves that runs through the book like a dark thread. This book has made some people (especially Americans) uncomfortable. That Eva’s being is not black and white and that satire, absurdity, black humor and naivety are all mixed into one cocktail, troubles. Thank you Jojo Rose for your review. Your mind is a sweetly scented rose in my book, pun intended.